Other winners and information about the recent banquet can be found at www.theedgars.com. What would it be like to quit your day job and spend the next year browsing dictionaries, copying example sentences, then prodding them together to form short — very short — stories? Jez Burrows knows. His book includes some very intense stories, comic, tragic, or simply contemplative. And, yes, most emphatically, this belongs in the mystery category. Many of his angsty productions feature murder, suicide, despair, acidulous remarks, and other criminous or unkind acts. The double life of a freelance secret agent? My nerves are shot. This is all getting too deep for me. At about ten at night, I got a call. A cold, dead voice. He told me my telephones were tapped and I was being watched — they see me as a traitor, a sellout to the enemy. I never thought Stash would rat on me. Times have changed. He had seen which way the wind was blowing. How cold and calculating he was. Little did he know what wheels he was putting into motion. The underscored words are the ones defined by the sentence or phrase in the dictionary. Burrows took a few liberties with tenses, people’s names, and conjunctions. Otherwise, it was fair play. The works are alphabetized, of course, by category and often sub-title. 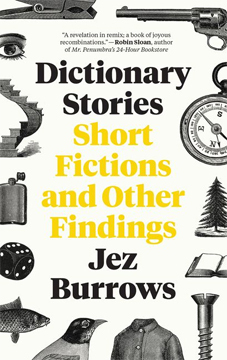 Two hundred and fifty-six pages of richness and delight. “What You Don’t Know About Charlie Outlaw” is a book about a crime, a kidnapping of a celebrity. There is a cold-blooded murder and a thrilling rescue from the side of a cliff. There is abandonment, cruelty, abasement, knife-work, and arguing, loud arguing. But it is not truly suspenseful. My bet is that that was never Leah Stewart’s aim. Instead, there is reassurance. There is even foreknowledge in some situations. Charlie has a television show. He is the main character. One day, as is the wont of media, he is being interviewed. There is nothing unusual about the interview, except Charlie finds himself telling the truth. Suddenly his life changes. The people from his show are angry. His girlfriend, another actor, dumps him, because he has unintentionally disrespected her. Savaged by all, he decides that the best thing for him to do would be to turn off his phone, grab a flight to an obscure island where English is not the first language, and walk, alone, into the jungle. He loves his girlfriend, Josie, and would do anything to put matters to right. It will be better after his walk in the jungle, he hopes. Back home Josie is regretting their breakup. When she was young she had a breakout hit television show. She played a tough girl who saved the world. (Think “Buffy the Vampire Slayer.”) Twenty years down the road, nothing great has come along to challenge Josie. As a matter of fact, it is extremely difficult to land parts. Between missing Charlie and being discouraged about her failed auditions, she is having a tough time. And now, she thinks bitterly, Charlie won't even return her calls. After Charlie is kidnapped by a bunch of islanders with very separate notions of what needs to happen, he gives them the name of his character instead of his real name. The result is no one knows Charlie is missing. Charlie’s life begins an existential journey without much choice on his part. It sounds depressing, doesn’t it? However, “What You Don’t Know About Charlie Outlaw” is a sweet and gently comedic book. And an authentic-sounding insight into acting. Charlie ducked his head, abashed, and murmured another thank-you. In the twenty or thirty seconds of silence that followed, during which she went on adoring him with her eyes, he realized that they might stand here together in this small enclosed space for the next ten minutes, or even longer as those artisanal vegan breakfast sandwiches take a long time to produce. Now what? Where do you go next in an interaction that starts with a declaration of love? British ex-pat Richard Crompton lives in Nairobi, Kenya. 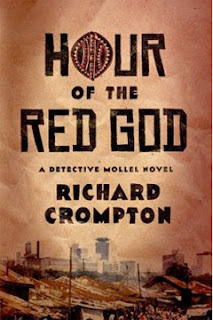 He was a BBC journalist who has found new life as the writer of an excellent first book, “Hour of the Red God.” His main character is Mollel, a Maasai police officer. Mollel is a mysterious character when he first appears. He has been dismissed to some backwater as a traffic cop following an unknown incident that occurred when he was a CID detective in Nairobi. He returns to his old stomping ground to assist in the murder of a young woman, whose mutilated body was found in a ditch. The first thing we see Mollel do is abandon and forget his nine-year-old son at a store as he chases a crook. Just as my anxiety level racheted up over the boy, I reached the part of the book in which Mollel suddenly remembers him. There was then a suspenseful interlude while Mollel found his son. And that’s not even the main story. Mollel’s wife is gone. His mother-in-law is critical of his parenting skills. He is traumatized and lost. There are mysterious pills he has to take. Upon delivering the crook he caught to the CID, he meets some of his old cohorts. Somehow he manages to become involved in the new case of the murder of the girl in the ditch. He is assigned Kiunga, a new detective, to assist him. The victim might have been a prostitute. Could one of her high-flying clients have silenced her? Was someone jealous of her? Did someone from her past catch up with her? The usual suspects, we think. But Crompton has thought his way into a complex story which takes us into the heart of Nairobian society and politics. Crompton does a great job of creating a picture of that society, complete with tribal affiliations and government corruption, struggling to fit into the 21st century. Before I start my next review, let me talk about cultural appropriation. There’s been a lot of discussion lately about that. I take it to mean that people who are not themselves of an ethnicity or cultural background, and thus fail a basic authenticity test, write (act, talk, sing, perform) authoritatively about that ethnicity or culture. So my answer is yes and no. As a person of color, I have been (mostly) amused by portrayals of Chinese people by Korean and Japanese actors, or vice versa. Yay for actors getting acting jobs, but boo to the people who thought all Asians look alike. (Although where I come from — Hawaii — there is a lot of genetic swirling, and many people can lay legitimate claim to being able to portray a trunkful of cultural identities.) Yay for “The Jazz Singer” bringing talkies to the world, but boo to blackface. Yay to people supporting the NAACP, but boo to the white woman who pretended to be black. So what do I think about people — mostly white — writing from the points of view of people of color or another culture. Mostly yay. Colin Cotterill, white and non-Laotian, writes a terrific series starring a Laotian ex-coroner who talks to ghosts and battles crime in his own quirky way. Cotterill did not grow up in Laos or Southeast Asia, but he lives there now and is bringing the Western world an interesting and informative look at different Asian communities without being patronizing. An inside look by an outlander. I like it. Richard Crompton is a Brit ex-pat, like Cotterill, who has settled down in Nairobi, Kenya, after working as a BBC journalist. His main character is Mollel, a Maasai police officer. 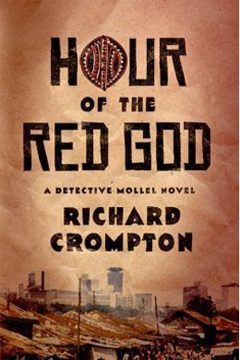 A review of “Hour of the Red God,” his debut novel, follows this pontification. As I’ve said many times — out of your earshot — it is not so much who tells the tale as how it’s told. This cultural appropriation stuff is messy, murky ground. I think, too, of how authors, like Donna Leon, bring us a culture viewed through a lens like the one we look through. Although Leon was born in the United States, she has lived in Venice for many years. Just living somewhere for a long time doesn’t automatically grant knowledge or insight, but I enjoy Leon’s look at life from a Venetian’s point of view. Despite her long-time residency in Italy, she can speak to English-speaking readers from a common cultural base. She knows what we don’t know about life in Venice and can address our ignorance. Reading a book written by an Italian and translated from Italian (e.g., Andrea Camillieri, Elena Ferrante) is a different experience. There is an expectation by the authors that their Italian readers will understand the sociological, political, and popular context. Would I feel differently about the books written by people who are outsiders to the group about which they are writing if I were a member of the group? I don’t have an answer. I do judge but I judge on the merits of the story, on how authentic it sounds, on respect for characters and culture, on atmosphere, on writing style. I guess that’s all any of us can do, unless convinced otherwise. A little Rudyard Kipling, anyone? I have a backlog of books to read. I’ve had them ever since Murder by the Book closed. I took with me books I had always wanted to read but never got around to. Now they are tumbling and rampaging around my house. I’ve read a few of them over the last six years, but my New Year’s resolution was to make a bigger dent in the piles. I decided to choose several books — new, old, forgotten, classics — and rotate them, a chapter of this here, a chapter of that there. I currently have seven on rotation. What are they? “A Brief History of Time” by Stephen Hawking. This book serves as the illustration in the dictionary of “a book a lot of people own but few finish.” I’m determined to finish it. It is the ultimate mystery book. Curved space, waves that are particles and particles that are waves. Quirky. Or do I mean "quarky"? “Americanah” by Chimamanda Ngozi Adichie. I had always wanted to read this book, even before I read her stunning essay in “The New Yorker.” After I read the essay, I moved the book closer to the top of the pile, but over the last year it remained there, just below the top of the pile. New Year’s resolution: Read it! “Sirens” by Joseph Knox. Recently read about this in some review. I needed to read a new book (c2017) by a new author. The main character is a Mancunian detective. Yes, I finally get to use the word “Mancunian” in a sentence! “Dark Money” by Jane Mayer. Is all that makes the world go around. This is a horror story (so far) about the dark uses of money by the dark, secretive billionaires who want to make more money. I’m left asking, how much money does one person need? “What You Don’t Know About Charlie Outlaw” by Leah Stewart. Funny, touching, out-of-the-box book about a television star being too honest in an interview. As his reward, his girlfriend dumps him and his series people probably hate him. Charlie has taken off for a hike in a jungle, where he is kidnapped by unorganized individuals. Actually, they are organized under only one principle: kidnap an American. “The Death and Life of the Great Lakes” by Dan Egan. This is the latest pick by the PBS Newshour/New York Times Facebook book group. Ecological disaster. Solution. Another ecological disaster. Another solution. That’s where I am right now. I’ve been doing this rotational reading for a few weeks now, and it is invigorating … as long as I can keep the books straight. That’s one reason for keeping them fairly diverse. A couple have already rotated out, i.e., I finished reading them. A couple rotated out because I wasn’t engaged by page fifty and saw no reason to continue. Book drop. My review of the seventh book on my list, the latest to drop out of rotation — because I finished it — follows in my next post. This book is nominated for the 2018 Edgar Award for Best Non-Fiction. “Killers of the Flower Moon” won’t be read for its breakthrough style or literary edginess, although it is thoroughly readable and author David Grann paces the presentation of the murders in a commendably dramatic way. It is the content that drives this non-fiction work. As location is to real estate, so content is to most writing. Grann has that covered. What is also satisfying is that Grann introduces his own sleuthing into the picture. 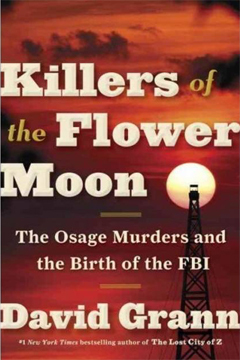 It is not just about reporting the atrocities of the Osage killings, a tragedy that stunned America when it happened (1920s through the 30s), but of doing research in primary sources and talking to people who were close to the victims. Reporters, the judicial system, and politicians made a big deal of the killings at the time, but the story was overwhelmed by other issues: e.g., the Depression, the Lindbergh baby kidnapping. It is Grann’s honor to have uncovered the story again and to have breathed new direction into it. Tom White was a Texas Ranger who became one of the first FBI agents, although it was a few years from being officially named the FBI. He was an honorable, intelligent man – luckily. There was so much corruption and racism at all levels of the Oklahoma community in and around the Osage Indian nation. Many members of the tribe were murdered, some clumsily and some with more subtlety. Although many clues and witnesses existed to the events, by the time White became involved, a lot had been covered up. J. Edgar Hoover was ambitiously trying to set up a nationally-established investigative department. He was not the rough-and-ready type himself and was a germaphobe, but his agents were canny and tough. Ex-Rangers made good agents to send into the fray in Oklahoma. Hoover hired White and let him recruit his team. Hoover was hoping a success by the team would lead to government approval for a new department. Central to Grann’s story is the inhumanity evinced by the “good citizens” of Oklahoma towards Native Americans. In their lights, the Osage were not fully human, intelligent, or capable of handling their own lives. They encouraged federal legislation to that effect. Why was it so important that the Osage be relegated to non-person status? Money. The “underground reservation” on the Osage land contained oil. Buckets and barrels and monstrous fountains of it. The Osage were among the richest people in America because of that. And that prosperity brought tragedy. Grann’s clear exposition of what happened to the Osage is stellar. The tragedy is riveting. And so disturbing. I’m glad this book was chosen by many critics as a best book and nominated for a bunch of awards, because this is a story that will probably be forgotten again. At least, with such a prominent book, the story may be resurrected again and again. Lest we forget. 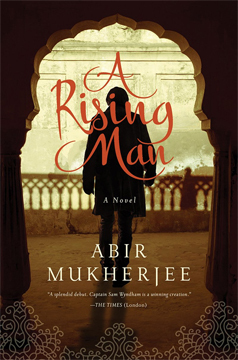 Can I admit that the only reason I continued to read “A Rising Man” was because of the author’s name? I would probably have given up reading after the first fourth (which I did) and not gone back (which I did — go back, that is) if the author had been, say, Albert Michaelson (not intentionally a real person). I read the part introducing Captain Samuel Wyndham, a Brit displaced, misplaced, re-placed to Calcutta in 1919, as a homicide detective. After closing the book at about seventy pages because of a case of the “meh,” I ignored it for a few months. Finally, I reopened the book and began reading again, and it was as though I held a new book in my hands. The story had changed (or I was in a better head space?). I found the rest of the book quite interesting. Recruited to Calcutta in the last days of the Raj, Sam is befuddled. Such a strange land. Such strange voices, clothes, food. And such strange fellow Brits. Some British people have never known another home, but they still identify as British, with British-style country homes, fashions, manners, appalling food. The people who would have been middle class with modest abode and habillement in England are owners of grand homes, with servants and rich trappings in Calcutta. Most of them have the arrogance and sense of entitlement that inevitably doomed them and their lifestyle in the end. Sam has brought baggage with him, too — the emotional kind. His wife died young and before they could establish a life together. And that led him to pick up a wicked opium habit. He is probably on the last of his nine lives. Then, within a few days of his arrival in Calcutta, Sam picks up a murder. The victim, Alexander MacAuley, is an aide to the Lieutenant-Governor of the Bengal government. His body was found in a seedy part of town, a stone’s throw from a bordello. Banerjee is the real main character, in my opinion, although he has fewer scenes and we don’t follow him around. He has the more interesting life, split as it is between the British sensibility, his tribal one, and his larger Indian community. He is the one who makes sacrifices. He is the one who understands why larger numbers of Indians are rising up against the British government. The conflict of his loyalties is the most roiling storyline. 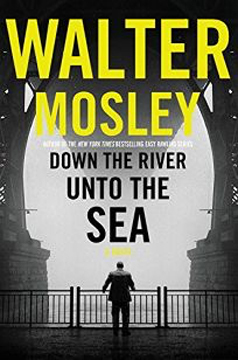 I went back to reading this book because it is nominated for the Edgar Award for Best Novel. (See a partial list of nominees and links to my reviews: here.) And because the author’s name is Mukherjee, which to my thinking, erroneous assumption or not, promised a more complex view of the days of the Raj. It followed through with that, but I hope the next book stars Banerjee. 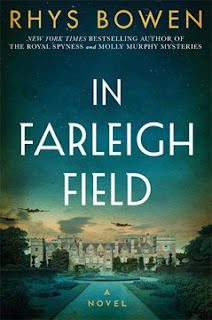 "In Farleigh Field" has been nominated for an 2018 Edgar Award for Best Paperback Original. Rhys Bowen is a very good storyteller. She has proven with her other historical mysteries (Molly Murphy, Lady Georgiana) that she can bring to life a kinder, gentler version of a different time. That’s what she has done as well with “In Farleigh Field,” a novel set during World War II in England. Bowen works with the cliché of the British upper class and its sense of superiority, and produces a charming and strangely relevant story set during the horrors of Hitler’s march to dominate. Perhaps modeled on the real-life Mitfords, Bowen’s aristocratic family has five daughters. The oldest is prematurely matronly (Olivia). The next is having a wrenching affair with a Frenchman (Margot) Then comes our heroine (Pamela). Then we have poor Dido who had the misfortune of coming of age during the war, thus obviating the need for a debutante presentation at court. Sob. And finally — you knew there had to be at least one — the plucky youngest daughter (Phoebe), who is too smart for her own good, steals the show. This is also the story of aristocracy depleted. Household staff have gone to war, leaving the “U”s to haul some of their own water, so to speak. Pamela (“Pamma”) has left home to join the war effort, primarily as a glorified clerk. Then she is tapped on the shoulder to do more when she becomes involved in reading German messages at Bletchley Park. Margot becomes trapped in Paris when she refuses to leave when the going is good. When the going becomes rough, she is captured by the Gestapo and given untenable choices. Her narrative breaks the rhythm of the British story, and it could very well have been left out, but Margot has a part to play at the end. Phoebe, of course, is the precocious child who sees too much. But is she capable of accurately understanding what she sees? Toss in Pamma’s old flame, an RAF pilot (and fellow aristocrat) who was shot down over Germany and recently escaped from a detention camp. And also Pamma’s childhood friend Ben, son of the local vicar, is necessarily the lovelorn victim of Pamma’s charms. Of course, there are a bunch of other village characters, most of whom seems suspicious, most of whom could be German spies. Deadly deeds in a demure district. It’s not that Bowen has created a unique mystery situation, it’s that she does it so competently and entertainingly.